Who Can Benefit From a Denture? You might think that dentures are only for people in their 70’s, 80’s or 90’s, but they can benefit people at any age. In fact, it’s not uncommon for much younger people to lose all of their teeth. A 2009 survey done by Fixodent found that almost 1 out of 5 American women over age 40 wear dentures. – Dentures are affordable, but it’s important to note that they must be replaced on average of every 5-8 years, which increases the long-term cost. – Modern dentures fit great and provide a natural-looking result. – You won’t need surgery. – It will be more challenging to eat particularly hard, crunchy, or tough foods such as corn-on-the-cob or steak. – Over time, you can lose bone mass in your jaws. – Dentures need periodic adjustments to help them continue feeling and fitting great. 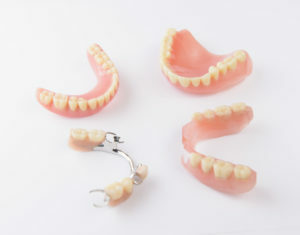 You’ve spent your entire life eating and speaking with your natural teeth, so adjusting to dentures is to be expected. Most patients report that they make the transition within 3-4 weeks. By closely following your dentist’s instructions, eating a diet of soft foods for several weeks, and experimenting with different adhesives, you’ll adjust more quickly. The most important thing is be patient, have realistic expectations – and remember that millions of people have successfully made the same transition. Tooth loss can negatively affect every area of your life. But by restoring your smile with dentures, you’ll be back to enjoying life again in no time! With nearly a decade of experience as a family dentist in Fort Worth, Dr. Jasmine Coleman King knows how much restoring someone’s smile after tooth loss dramatically improves their quality of life. She always thoroughly evaluates each patient’s dental history, needs and goals so she can recommend the best replacement option for them. If you’re thinking of getting dentures or have other questions, she can be reached via her website or at (817) 292-7488.